Zoeller Forge was established in early 2000 after its founder, Larry Zoeller, discovered that his gas forge burners that he created were becoming increasingly popular. Now, Zoeller Forge sells gas forge parts and refractory products to Blacksmiths and other metalworkers all over the world. Zoeller Forge uses the Internet for 95% of its incoming orders, making Zoeller Forge a truly online company. Have more fun with your gas: Forge with it! Above is a picture of the touchmark that Larry now stamps on the pieces that he creates. 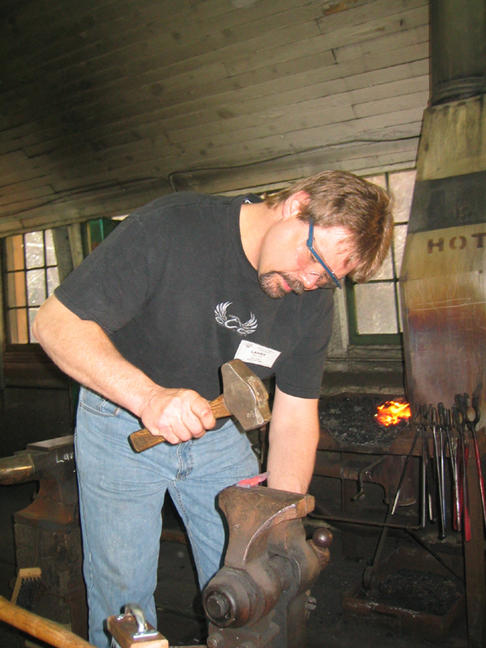 A touchmark is the mark that a blacksmith or other craftsman makes on his product to identify himself as its creator. August 03, 2018: New item added to the Gas Forge Parts page. INSWOOL®-HTZ BLANKET 8#. 2600°F A Ceramic blanket that is use to line the inside of gas forges. Click on the link above for more information. January 30, 2018: New item added to the Blacksmith supply page. Tong clips. See supplies page above for more information. December 07, 2017: Just in time for the Holidays Large Jingle Bell blanks are in stock. September 2, 2017: Simple Air Hammer web page has been updated. August 28, 2017: Tutorial on building a gas forge using a portable air tank has been added. See the air tank forge link above. June 11, 2009: A Blacksmith / Bladesmith Supplies page has been added to the website. This page will have some hard-to-find and unique items for sale to blacksmiths. April 10, 2009: The Simple Gas Forge plans have been updated. See the Simple Gas Forge link above for more information. The picture above is of Larry Zoeller working on a leg for a trivet in a class that he took at the John C. Campbell Folk Art School. Listed below are some links to pictures of the equipment that I have built for my shop and also some items that I have forged .